all the little stories» Blog Archive » notes of note. It’s been a busy week! And a good week, too. Something I was rather excited about was that an episode of a podcast that I was invited to be a part of aired this week! Steph (from The Daily Digi—a fabulous blog all about digital scrapbooking) is the host of The Paperclipping Digi Show and I was sent an invitation to be a part of episode 12! Can you see why I initially freaked out?! My first thought was “Oh my gosh! Why do they want me? !” I thought for sure we’d be talking about hybrid scrapping or papercrafting (because of The Hybrid Chick, The Digichick’s sister site that I run)… that’s all I could think of! LOL! But it turns out, no… they just wanted me for me. Now that make me feel like a superstar, too! 😀 I was on Cloud 9. If you’d like to listen along to the episode, you can find it here: PDS 012 – Not Ready to Go There (you can listen right there on the site or subscribe in iTunes, too). You’ll get to hear me ramble on about my multiple design personalities, lenses for SLR cameras and the topic of the day: How to do hidden journaling on a digital page. Yup! You heard that right! Took me a while to come up with an answer that was more elaborate than “Well… you can’t.” HA! I appreciate Steph’s confidence in me as a panelist—because that was one hard topic! But we did it. And I think we brought some great ideas to the table, too. I thought I’d post a video here for you as well. Last year when Travis and I were working on a redesign for The Digichick, we used a site for chatting with the designers and creative team girls while we waited for things to be back up. Travis discovered that you could also post videos, so we made a few for everyone to see. We just dug them up and moved them over to Travis’ YouTube Channel, so we wouldn’t loose them again. In other news… Socks! Not just one, but two! I decided that I would meet Second Sock Syndrome head-on and go ahead and start on #2 right away. 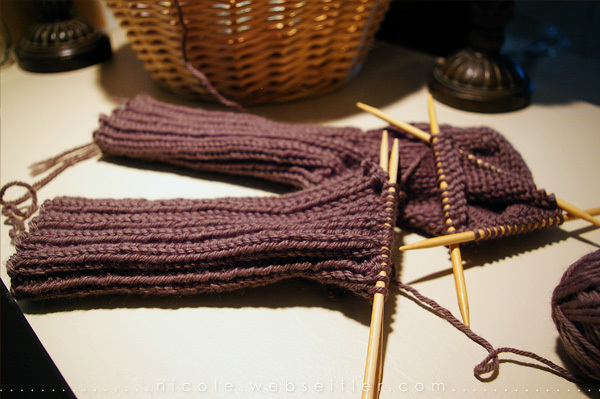 Since this pattern calls for a set of #7s and a set of #8s, once I switched needles on Sock #1, I cast-on for #2! It was good timing, too. We were about to watch a movie the other night, so I wouldn’t have been able to focus on all the crazy “K1, Sl1, K1, psso” stuff that was waiting for me on Sock #1. And in the process, I knit 7 inches of ribbing for Sock #2. Woo-hoo! That was pretty awesome. And I redeemed the night—because the movie was awful. This entry was posted on Friday, August 20th, 2010 at 1:39 pm and is filed under arts & crafts, family, just life, knitting, scrapbooking, the digichick, videos. You can follow any responses to this entry through the RSS 2.0 feed. You can skip to the end and leave a response. Pinging is currently not allowed. You are a giggly!!! *grins* That was fun to watch. And yay on the socks, and the radio personality!! 🙂 Yay for the Digi show and the socks! You are rockin girl!